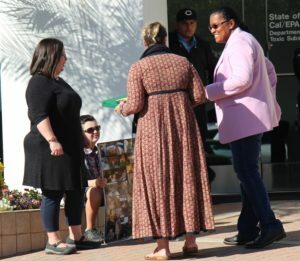 Nearly two dozen protesters demanding a promised comprehensive cleanup of the Santa Susana Field Laboratory (SSFL) picketed a Department of Toxic Substances Control (DTSC) bi-annual meeting in Chatsworth April 10. 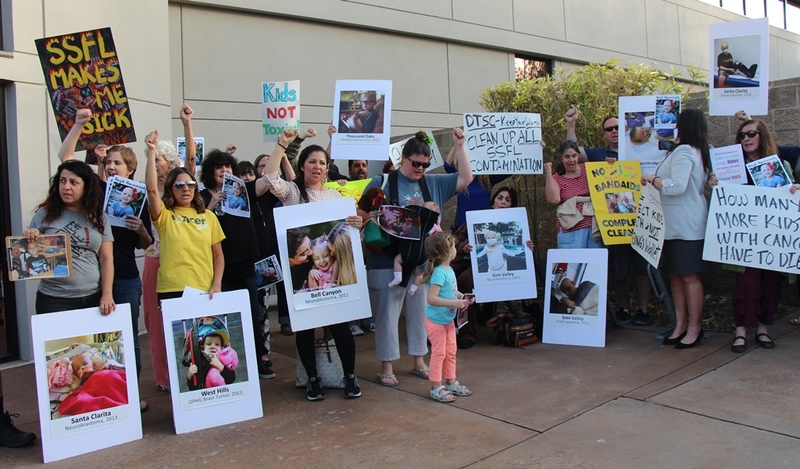 The activists included mothers of children suffering from rare cancers that they believe are linked to SSFL’s radioactive and chemical contamination. One of those children, seven year old Hazel Hammersley, had succumbed to neuroblastoma just weeks earlier, on March 30. Longtime Rocketdyne activist “Wild Bill” Bowling of the Radiation Rangers held a “Kids NOT Toxins!” placard next to a “HOW MANY MORE KIDS WITH CANCER HAVE TO DIE” sign in the hands of Dawn Kowalski who has fought for cleaning up SSFL since 1989 and helped found the Rocketdyne Cleanup Coalition (RCC). “Losing Hazel has been devastating to us, but her mother wants us to use her passing to push even harder for this cleanup,” said Melissa Bumstead to the protesters who gripped grim photos of children suffering from extremely rare cancers who live in the SSFL region, like Bumstead’s own daughter Grace Ellen. Bumstead is the founder of Parents vs SSFL. Once inside the sweltering auditorium, nearly 200 attendees were treated to cramped displays elbowed into crowded aisles. (This reporter managed to flag a friendly security guard who turned the air conditioning on as a 91 year old senior in a wheelchair was about to pass out.) 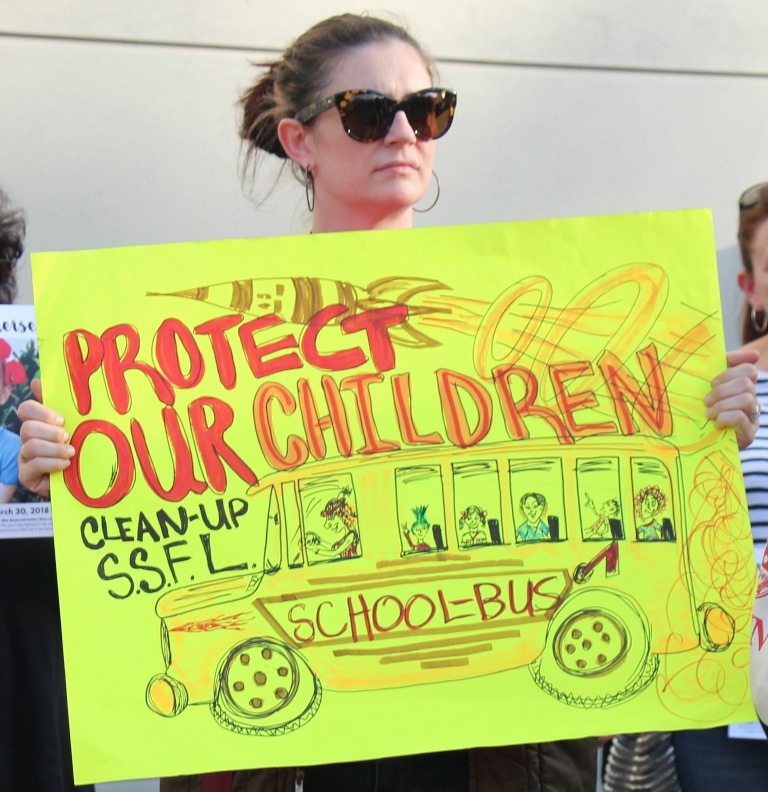 Only 30 minutes were allowed for the public to voice their concerns, even though DTSC holds community SSFL meetings just twice a year. 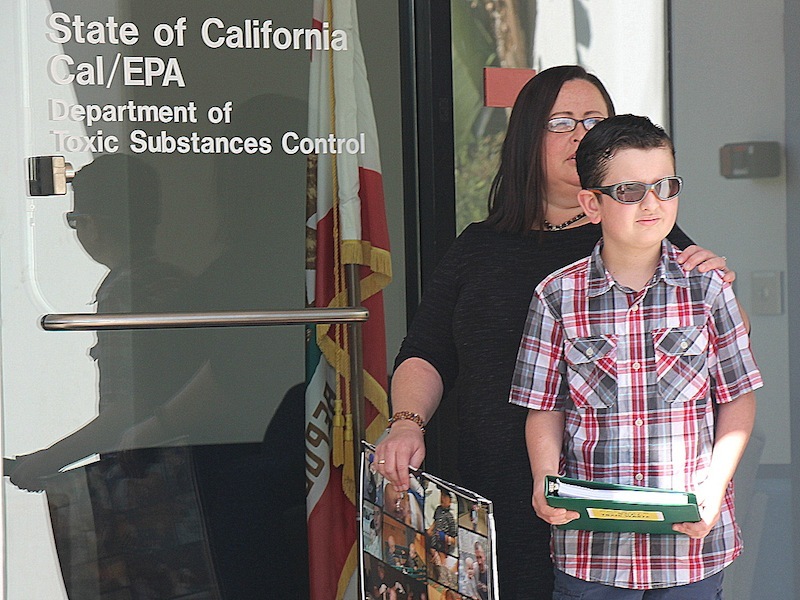 DTSC hasn’t “found” any evidence because it hasn’t looked for it even when the evidence is in the reports that it has released and should have read, and that are exposed in the media as in EnviroReporter.com’s Brandeis Bardin’s Toxic Denial in 2017. 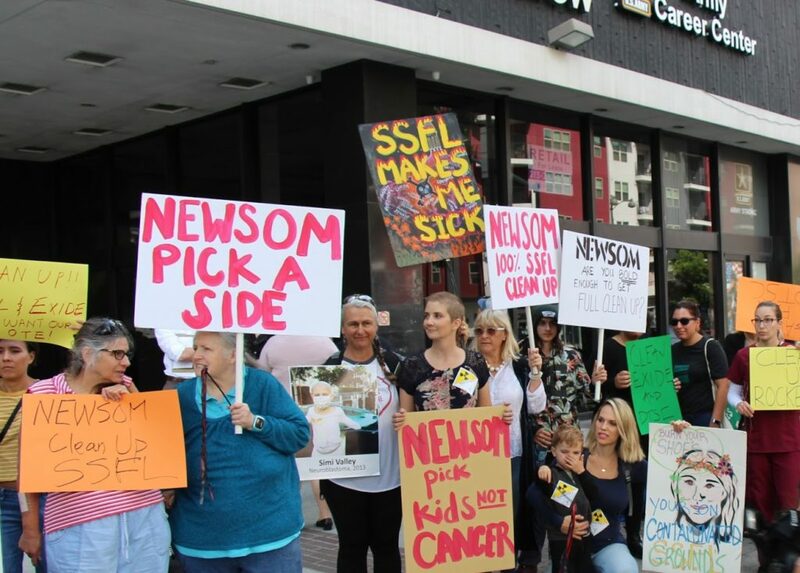 By denying that any offsite SSFL contamination exists, DTSC excludes Brandeis-Bardin from remediation of its impacted property, not that the owners of the camp, American Jewish University (AJU), are in any hurry to address these shocking radiation finds. AJU has never issued any comment or statement about these SSFL-impacted wells down in the bottom of Meier Canyon and within easy reach of unsuspecting hikers. The last confirmed sighting of one oozing Brandeis-Bardin well was in early 2014. 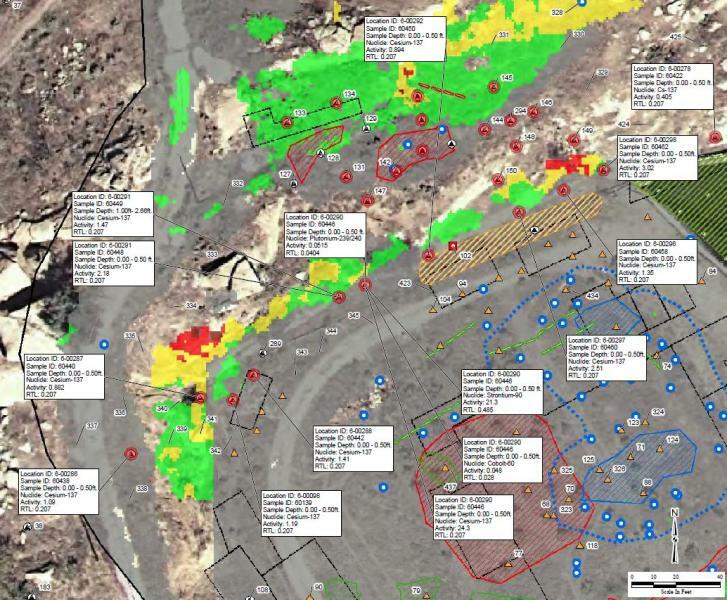 The DTSC presentation included a map showing seven offsite drainages into Brandeis-Bardin, six of them emanating from nuclear experiments Area IV, yet made no note of the Jewish camp’s radiation-impacted wells caused by the Department of Energy. DOE and its predecessor’s scandalous litany of open-air radiation incineration, radioactive waste dumping and partial nuclear reactor meltdowns get a free pass by DTSC declaring no offsite toxin migration. Brandeis-Bardin gets the short shrift by DTSC. 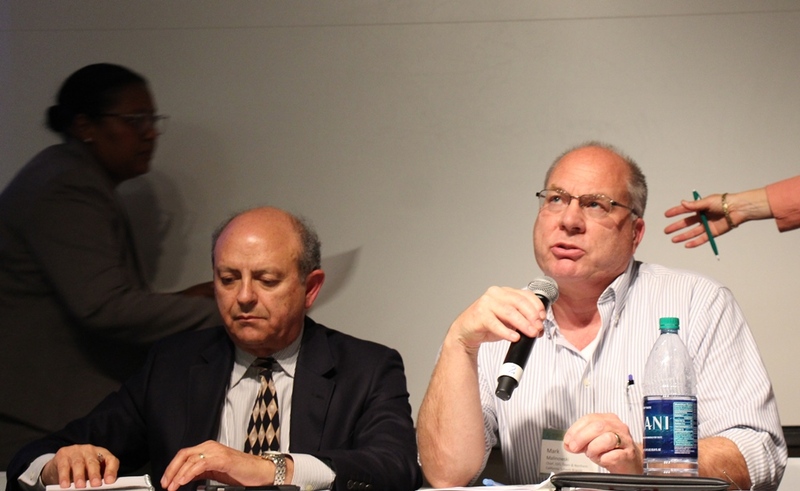 “Santa Susana contaminants have not migrated offsite at levels that threaten human health,” said SSFL program manager Mark Malinowski to the audience. The DTSC official apparently forgot that there is no ‘safe’ level for the “fission product” and isotope related to the “reactor control rods” found in the offsite Brandeis-Bardin wells. Malinowski did offer up one tidbit of cleanup progress, however ridiculous sounding. Since November 2017, DOE has started up “Groundwater Interim Measures” that consist of a “single, low flow well” that filters all of five gallons a week. Actually, Ahmanson Ranch groundwater tested positive for the SSFL-related rocket fuel oxidizer perchlorate in 2002 after this reporter’s questioning of the use of this possibly tainted water in an approved Washington Mutual development of 3,050 luxury homes bordering SSFl. DTSC should have known this for the last sixteen years since it was widely reported. The ‘WaMu’ development was scuttled the next year as more contamination revelations piled up. Yet DTSC can’t even get this well-known history of the area right and displays it in public in an effort to maintain the myth that no SSFL goo has gotten offsite. 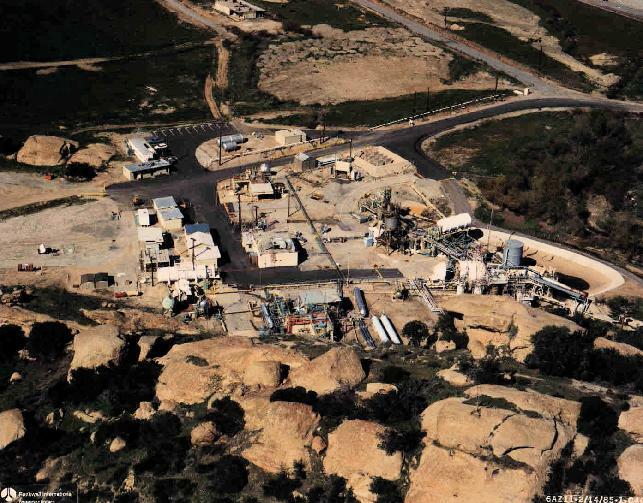 Reports released by DTSC just after the public meeting reveal that the department failed to inform the public about even more contamination found onsite at the former Rocketdyne outdoor testing range. One such document arrived in a May 14 DTSC email that included previously unpublished DTSC comments on Boeing’s reports on Subarea 5/9 South. 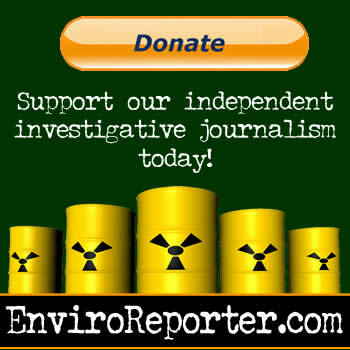 EnviroReporter.com had already reported in 2009 about intense chemical contamination in Boeing-controlled Area III of the lab which included the Space Technology Laboratory IV (STL-IV), the Environmental Effects Laboratory (EEL) and the Area III Sewage Treatment Plant (STP-3). The known Area III chemical stew includes monomethyl hydrazine, methylene chloride, sodium hydroxide, formaldehyde, nitric acid, sodium azide, dimethyl sulfoxide, hydrofluoric acid, hydrazine, TCA, TCE, and polycyclic aromatic hydrocarbons (PAHs). The runoff from Area III makes its way through the tony neighborhood of Bell Canyon as it descends into the Los Angeles River where the watercourse is undergoing a $1.4 billion revitalization. Nothing in the LA River plan addresses the contamination at the SSFL headwaters of the polluted waterway which could lead to human contact through wading, kayaking and eating fish from the river. Area III’s STP-3 reading for the radioisotope Europium-152 came it at 3.6 times its background threshold value (BTV). Strontium-90 (Sr-90) detected at the EEL was 3.5 times its BTV according to readings taken by Boeing subcontractors assessing the site. According to documentation obtained by EnviroReporter.com, the California Highway Patrol considers any material or situation over 3.0 times background to be the triggering level for a hazardous materials incident. The most alarming radiation reading came in the area of the former Space Technology Laboratory IV. There, Sr-90 registered a sizzling 11.1 times its BTV, over three times the CHP Haz-Mat threshold. None of this was mentioned at the meeting once DTSC officials began the public portion of the evening. • An astonishing 96 people out of a 100 exposed, at the Systems Test Lab IV, would get a cancer from the contamination on site. • Every third person exposed at the Environmental Effects Lab would get a cancer from the contamination on site. • Every fifth person exposed at Happy Valley North would get a cancer from the contamination on site. • Every tenth person exposed at Compound A site would get a cancer from the contamination on site. This bold assertion is contradicted by the facts. In addition to a $41.5 million study of Area IV completed in 2012 courtesy of President Obama’s initiative, exactly where and how much of the radionuclides and chemicals are in Area IV is well known. The work completed by DOE since 2010 was up on a meeting poster. Over 3,600 radionuclide samples, 6,500 chemical samples and 100 soil vapor samples were taken resulting in comprehensive reports in 2012, 2015 and 2016. That was just in Area IV. Another meeting DTSC update showed that Boeing had completed its soil sampling field work after collecting over 7,500 soil samples and 650 soil vapor samples since 2012. These impressive numbers, and their resultant reports, don’t even include the data generated by NASA in its responsibility to clean up its part of SSFL, including Area II. Malinowski feigning incomplete information as the reason for no cleanup was met with derisive hoots from the crowd. Further outraging the audience was the revelation that DTSC’s public participation supervisor Michelle Banks-Ordone, seated on stage next to Malinowski, had rejected 72,000 public comments on a petition demanding full cleanup of SSFL despite a personal pledge to a young cancer survivor who gave them to her in person. This elicited a rambling response mysterious in its meaning. Indeed, this reporter and two others from the Los Angeles Daily News and CBS Los Angeles witnessed the brave child, and leukemia survivor, Ryan Compton deliver the comments to Banks-Odone at DTSC offices in Chatsworth, promising the boy that, of course, she would accept the petitions he gave her under the watchful eyes of his mother. 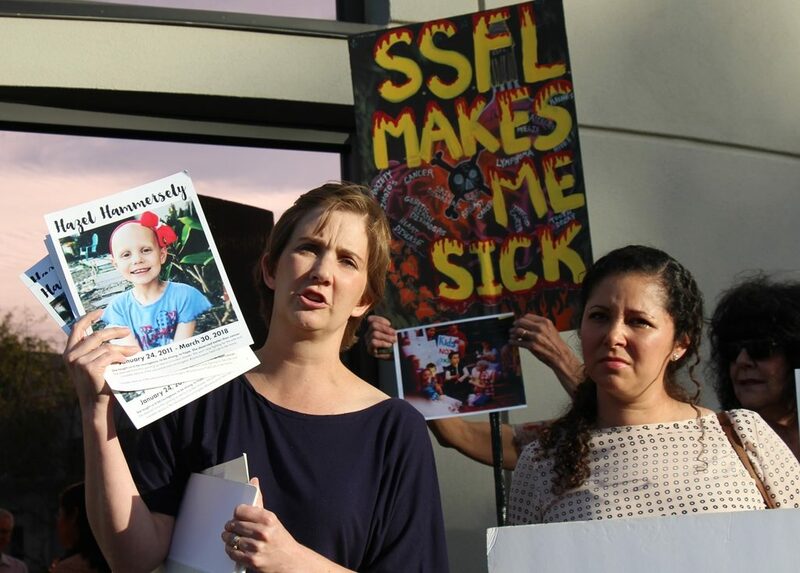 Maggie Compton believes her son’s leukemia was a result of offsite SSFL toxins. 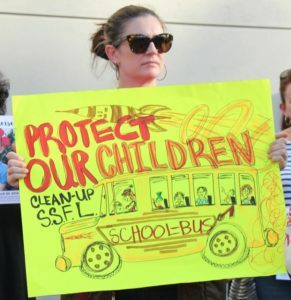 Not only is DTSC breaking its own promises, it appears to be letting SSFL polluters break their cleanup agreements as well. 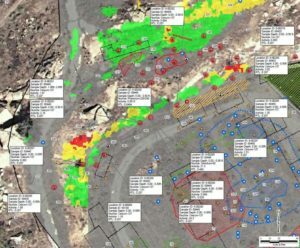 EnviroReporter.com found a little-noticed June 2017 NASA report called Human Health and Ecological Risk Assessments for NASA AIGs Santa Susana Field Laboratory in which the space agency reneges on its 2010 pledge to DTSC to remediate its polluted areas to background levels of contamination. Instead of adhering to the signed cleanup agreements, NASA would use risk assessment based on recreational standards, which would leave almost all of the contamination in place. That isn’t good news for Brandeis-Bardin or future visitors to any Glow in the Dark Park that might open at SSFL before the new 2034 cleanup end time. DTSC has previously said it would enforce the NASA and DOE cleanup agreements, but that seems unlikely given that its 2017 draft Environmental Impact Statement (EIS) sabotaged the entire cleanup and was panned by community members and elected officials. DTSC says it will release its final EIS this fall, followed by “decision documents” that will be open for public comment, representing the last opportunity the public will have to officially weigh in on the cleanup. Some residents aren’t so sanguine about their prospects of ever seeing Rocketdyne cleaned up. They understandably think the endless delays and breaking of promises are by design. “Lt. Governor Newsom is committed to understanding more about the complexities around Santa Susana and the long-standing issues there, and charting a path – in partnership with the community – to clean up the site without further and unnecessary delays,” said the statement. Things may be changing up on The Hill soon enough should Newsom win the governor’s race. Cleanup proponents EnviroReporter.com has heard from are now voting for Newsom and telling their friends and neighbors about Newsom’s bold stand on finally remediating the astronomically contaminated Santa Susana Field Laboratory. It’s been TWENTY years that this has been going on. Boeing will never pay, now that they’ve captured the DTSC. And the toxics will never go away unless they’re physically removed. It’s time to slash defense spending — get Boeing where it hurts. You can still sign our petition at http://www.change.org/santasusana to demand the complete cleanup. @Dale: That “sufficient awareness” of risk is as unlikely as the cleanup to background agreed to in 2010. The public’s right to comment on the SSFL cleanup has been slashed and will end soon, all by DTSC design. The pressure from the press has evaporated with newspapers abandoning the beat for lack of reporters. And that 10 years you cite is actually 17, as in 17 years before SSFL is supposedly cleaned up by 2034. These delays and schemes to leave most of the goo in place actually backfire on the greenwashers’ Glow in the Dark Park scheme because of how much contamination will be left in place. I have little faith that DTSC will ever require that SSFL be cleaned up to background levels. I am hopeful that sufficient awareness will eventually be generated so that everyone down wind and down stream will know their personal risk level. As long as the public is allowed to comment and pressure is applied through the press, we may finally get some remediation. But, 10 years! That’s beyond a reasonable amount of time to begin remediation work. Thank you, Michael Collins, for staying with this story and keeping it alive. Let’s hope the title of this article does not come to pass before the responsible parties finally clean up SSFL.